It was by sheer chance that I saw a 'Shan Sindhi Biryani Masala' packet at Total superstore and decided to try out the recipe. Of couse, I did not buy the masala packet as I usually avoid the ready made masala mixes( with a few exceptions ofcourse when I am not too about the masala proportions.....should have mentioned this before but anyways thanks to one of my readers to point out this blunder ). Around the same time someone posted the recipe on FB which I thought was good but too much spicy. It made me browse around for sometime till I zeroed in on the ingredients I wanted to put into my version. Apart from the usual stuff, the important things that were supposed to go into it were the big potato chunks and some apricots. The heat from those green chilis is obviously negotiable. But since I did not have apricots in store, I used a mix of raisins and dried cranberries. Preparation - Slice the onions thinly. Soak the raisins and cranberries in some hot water for 1 hour. Wash and marinate the chicken with salt, turmeric, powdered masalas and yogurt. Cooking - Heat the oil for frying the onions. Fry the onions till brown. Remove and keep aside. Remove excess oil from the wok. Add the remaining whole spices ( keep aside the black cardamom and 2-3 cloves) and fry till fragrant. Now add the browned onions keeping aside a few for layering. Add the GG paste along with the crushed green chilis. Add chicken and fry for 6-7 minutes on high till it stops oozing water. Add the pureed tomato, mint leaves and coriander leaves, and cook for 5-6 minutes. Add the boiled potato and pulped raisins and cranberries. By this time, the chicken should be cooked through. Boil water in a large pan for cooking the rice. Wash the rice and add to it. Drop in one black cardamom, 2-3 cloves, salt and 1/2 tsp ghee. Cook till 3/4th done. Drain immediately and keep aside uncovered. Take a thick bottomed vessel. Brush the insides with ghee. Then spread 1/2 of the cooked meat followed by half of the rice. Then add the remaining meat and finally the remaining rice. 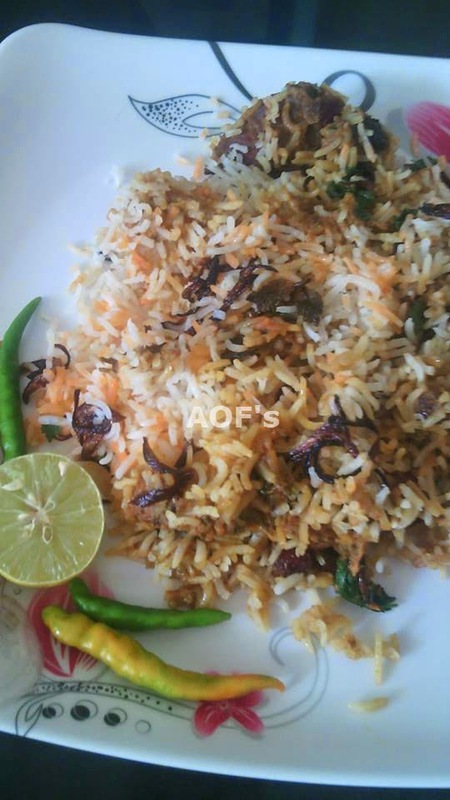 Sprinkle fried onions, mint leaves, lemon juice, ghee and some food colour. Close the lid tightly so that no steam can escape ( use some dough to seal the edges ). Cook on 'dum' for 15-20 mins. Keep aside for another 10-15 mins before opening. Yum. Its something my kids will love.